Koreans Choose Rice for Vibrant Energy! CJ Freshway and Local Farms Protect it with "Contract Farming"! While rice consumption has fallen in Korea in recent years due to the growth of single-person households and the popularization of Western-style diets involving bread and pasta, Koreans have historically always chosen “steamed rice for vital energy”. Caught up in the hustle and bustle of contemporary life, we can sometimes forget the vitality of rice. Indeed, in contemporary urban life, the sight of Koreans sitting down to eat rice, soup, kimchi and side dishes is an increasing rarity. that you didn't want to move. ▲ Precious rice giving "vital energy" to Koreans! Per-capita annual consumption of rice stood at 136kg in 1970s, but soon fell at an annual rate of between 2-3kg per year. By 2015, it had more than halved to about 63kg. Considering that 100 to 120g of rice is put into a standard bowl of steamed rice, it is estimated that Koreans, on average, eat less than two bowls of steamed rice a day. The fall in rice consumption has led to a decline in the number and size of farms cultivating rice. However, the harsh economic reality is that rice supply still exceeds consumption. ▲ Our rice growing in this vast field! The good rice harvest of 2015 brought up overall rice production to 4.327 million tons, its largest amount since 2009. Given that annual expected consumption is about 3.97 million tons, this means that around 300,000 tons of rice were stockpiled. And yet, the situation is worse than that on the ground. Under the terms of a trade deal signed by Korea, there is a mandatory import quota of 400,000 tons of rice, meaning overall stockpiles are growing far faster. Despite dwindling rice consumption, total rice production and import volumes are increasing. Korean farms that cultivate rice are facing hard times. While the government purchase system was introduced to overcome this situation, its limitations mean that farms cultivating rice have no choice but to find new markets. This can be very difficult as the amount of rice remaining after government purchase reaches 50% of the total annual rice crop. Contract Farming Gives Farmers Hope! ▲ Farms in Hwangdeung-myeon, Iksan-si, Jeonbuk, Korea started this year's first rice planting early in June. but their smiles remained undimmed. We have become quite busy recently due to the early start of the rice planting season. We work up a sweat all day, working from dawn till dusk. And yet, we feel relieved more than anything. This is because we have been able to find a new market thanks to the contract faming agreement we’ve put in place with CJ Freshway. One of Korea's four largest rice-producing areas is located in Hwangdeung-myeon, Iksan-si, Jeonbuk, Korea, which is the middle of the Honam Plains and well known as the country’s breadbasket. More than 90% of local residents are employed in rice cultivation. While in previous years they could pay for their children's college and marriage with their incomes from rice farming, the rapid fall in rice consumption has made managing family finances increasingly difficult. Farmers who had been deeply concerned about finding a new market for rice were relieved to be able to enter into a contract farming agreement with CJ Freshway in 2016. The field where 240 farms cultivate rice has an area of about 720,000 pyeong. CJ Freshway has agreed to buy all 2,275 tons of rice which are produced annually from the farm. Farms, agricultural cooperatives, the local government and local businesses have set a common goal of contract farming and are now working to make it a success. ▲ Hope began to grow as farms entered into a contract farming agreement with CJ Freshway. A new market opened up for them, but another challenge remained. Population aging means it is increasingly difficult to source enough workers for rice farming. It is commonplace to hear of farms struggling to source enough workers during the busy farming season. Agricultural cooperatives have emerged to provide a helping hand. Hwangdeung Agricultural Cooperative Federation's rice processing complex helps farms sow seeds in a field, contributing to quality maintenance. It involves itself in the entire process of rice production, from sowing seed in the seedbed to planting rice plants, preventing harmful insects and to carrying out the fall harvest. 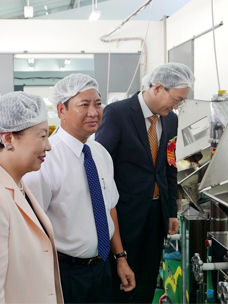 ▲ Hwangdeung Agricultural Cooperative Federation's rice processing complex for healthy and delicious rice! ▲ Sanitary rice production process from processing to pounding! The rice polished by pounding at the rice processing complex goes through wholesale and retail dealers on its way to the end consumers. The numerous distribution stages separating farms from consumers decreases consumer welfare. However, contract farming allows the direct delivery of rice from the rice processing complex to CJ Freshway, guaranteeing quality maintenance and affordable prices. Healthy and Delicious Rice, Enjoy It through CJ! ▲ The work of sowing seeds enhances quality maintenance. Contract farming allows farms to dedicate themselves to farming without worrying about finding new markets, while CJ benefits from being able to source guaranteed high-quality rice. Fewer distribution stages, moreover, encourage consumers to engage in rational consumption. Therefore, the contract farming is a system which benefits everyone. 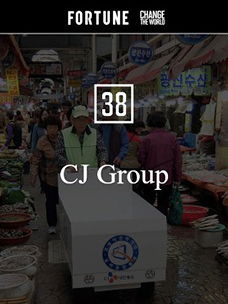 General manager Lim Hee-taek of the agricultural produce team at CJ Freshway spoke of the benefits of the contract farming, adding that CJ Freshway would buy as many as 10,000 tons of rice from Hwangdeung-myeon in 2017. ▲ The rice will grow with hope! High-quality rice is produced by the hard work of honest farmers and sourced by CJ Freshway! Where can we get it? This rice has been used to product "Instant Rice" by CJ Cheilejedang. It is widely tipped to be supplied as warm and shining steamed rice for CJ Freshway's contracted food service. Plus, it will be supplied for "Season's Table" and "Bibigo," the gourmet restaurant franchises of CJ Foodville, and will be sold as one of food ingredients which are clean and reliable for large food service franchises or communal dining.